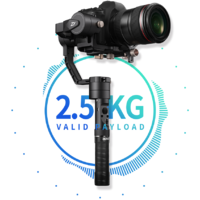 The Zhiyun Crane Plus is our latest gimbal, providing a solid mix between the best features of the original Crane and the new Crane 2. Aside from its 12 hour battery life and interchangeable batteries, one of the most valuable features on the Crane Plus is the addition of a 45° POV mode. 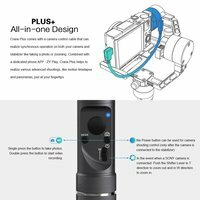 This allows you to tilt the gimbal and let the camera follow your tilt direction! The Crane Plus supports the majority of both DSLR and mirrorless cameras that weigh up to 2.5 kilograms. Made from solid aluminum, the Zhiyun Crane Plus feels premium through and through. 2.5 KG / 5.51 LB PAYLOAD: Crane Plus is pushing the limits even further than before! Using our cutting-edge, 6th generation Instune Algorithm System to power the motors, Crane Plus can handle a massive weight capacity of up to 2.5kg (5.51lbs). Whether you're using mirrorless cameras with kit lenses or professional grade DSLRs with heavier lenses, Crane Plus can now handle a significantly-wider range of camera and lens combinations. Plus+ MOTION MEMORY: Set up advanced camera movements, such as time lapse settings, by adjusting the interval, number of shots, duration, and more with the touch of a button. The Crane Plus will remember the settings, enabling you to repeat the same moving shots again and again! FPV MODE POV (POINT OF VIEW) MODE: Crane Plus adds a newly designed POV (Point of View) mode that allows for additional camera movement by providing up to 45 degrees of synchronous motion on the roll axis, What this means is that rather than Crane Plus keeping the camera level when you roll left or right, POV mode will move with you and roll your camera left or right, up to 45 degrees. Even simpler, when you move, your camera moves with you. The addition of POV mode, along with the 3 other modes on Crane Plus give you the level of control and freedom you need to capture almost any shot possible. The only limitation is your imagination. INTELLIGENT OBJECT TRACKING VIA APP: The Crane Plus can easily track moving objects and shoot scenes completely hands-free when using the Zhiyun app found on the App Store and Google Play Store. NIGHTLAPSE: In the past, gorgeous timelapse photography was limited to daytime shooting. The Crane Plus smashes that barrier by introducing the NightLapse feature: A powerful new tool for creating gorgeous, long-exposure timelapses that add in a new dimension of motion and depth. Using Crane Plus with NightLapse, you can capture stunning star trails, moving nighttime traffic, capture the passage of time over beautiful nighttime landscapes, and all with the stunning motion and stability that only Crane Plus can provide. 60 SECOND BALANCING: Whenever you're filming, time is of the essence. With Crane Plus, you'll spend as little time as possible getting setup up and balanced so you can get straight to shooting. Get to filming fast and never miss a moment. 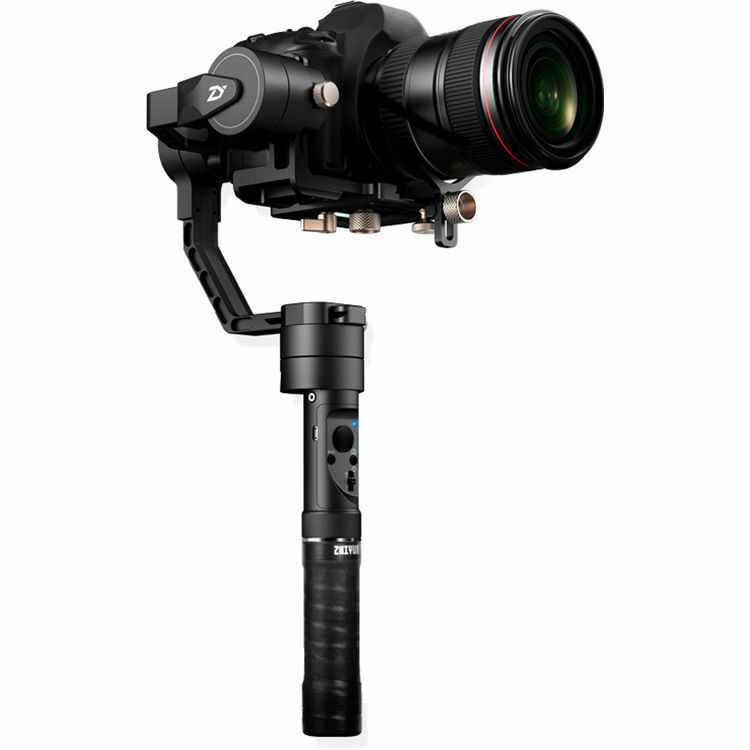 ​The Zhiyun Crane boasts a variety of accessories - all of which are included with the gimbal - and includes a stylish yet functional carrying case.